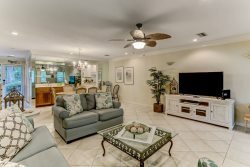 Amelia Island Vacation Rental - 2 bedroom, 2 bath condo with pool and tennis. This first story condo is three blocks from the Atlantic Ocean--an easy walk in less than 200 yards. Forest Ridge has a centrally located pool, plus tennis courts and a playground. The grounds contain peaceful ponds, fountains, and a wandering creek! Amelia Hideaway can accommodate 6 guests with 2 bedrooms (1 king and 1 queen), a sleeper sofa and 1 full bath. The condo includes a fully equipped kitchen, washer/dryer and private back porch nestled under the beautiful oak trees of Amelia Island. The home features spacious bedrooms, recently updated decor, fully stocked kitchen with pantry and large prep area. Four grocery stores are within a five-minute drive. All linens and towels are furnished. There is also a large dining area. The dining table has a leaf for large family meals. Pets are allowed. In the unit, there are two TVs with generous channel selections and free wi-fi. There is a designated parking place, plus visitor parking. The building is the closest location to the beach in Forest Ridge. The beach access is near single-family homes, not high-rise condos, so the beach is quiet and uncluttered. You will be within walking distance to great restaurants, night life and a surf shop. It's a short drive to Fort Clinch and downtown shopping and dining. Fernandina Beach Golf Club and Amelia River Golf Course, both public courses, are minutes away. Fishing opportunities abound, with ocean fishing, Egan's Creek, charters and pier fishing, all nearby. Miniature golf and a cute ice cream and sandwich shop are a short drive or a fun walk away. Trolley and boat tours are available in historic Fernandina. Downtown Jacksonville is 45 minutes away. St. Augustine and Savannah are less than two hours away. DisneyWorld and Universal Studios are three hours away and doable for a day trip.